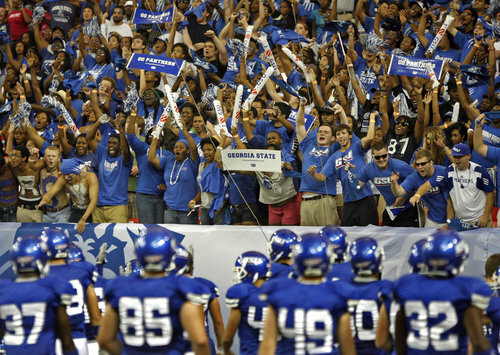 Although these Georgia State fans may look like they are cheering for the football team, they are really overcome with joy because they know that National Library Week starts on April 10th. National Library Week is an annual celebration of the contributions of our nation’s libraries and librarians. This year, National Library Week is April 10-16, 2011. “What if I am not a librarian? Can I still participate?” Of course you can. Everyone can celebrate the awesomeness that is library week. In honor of this occasion, the College of Law Library has several events and activities planned during this time for students. The Law Library will be doing two Library Abridged table sessions on Monday, April 11th from 2:30 p.m. – 3:15 p.m. and Tuesday, April 12th from 5:00 p.m. – 5: 45 p.m. The topic will be “Apps for Lawyers and Law Students.” As always, the table will be located in the first floor lobby by the front entrance to the law school and there will be free coffee and cookies. Chances are if you drop by you may even get to put your hands on, but not keep, an iPad.